Drunk on the joys of the season, I created Rum Glazed Cookie Cream Buns. Doughnut textured buns stuffed with cookie cream, smothered with rum glaze and topped with Japanese cookie crumbles, Rum Glazed Cookie Cream Buns are this Ninja Baker’s celebration of Christmastime dessert! 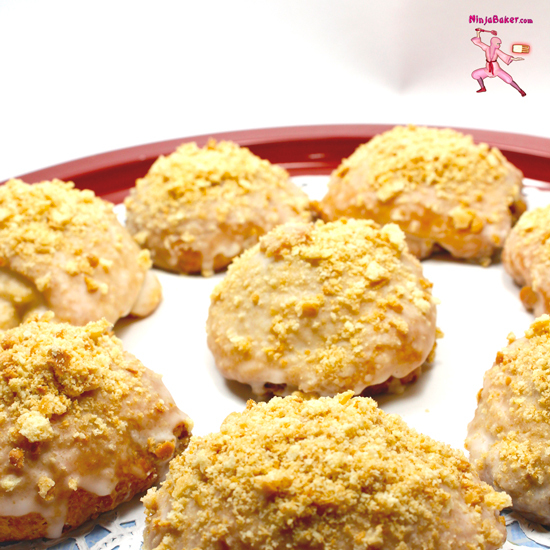 Japanese sables garnish Pillsbury Bake-Off inspired cookie cream buns glazed with rum icing. The Japanese butter sable cookie package reads, "The parent-child snack for Mama and me." 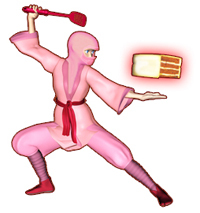 Indeed, the cookie has delighted generations of children...including this Ninja Baker and her nieces and nephews! The recipe is adapted from Pillsbury Bake-Off finalist, Megan Beimer ’s Chocolate Doughnut Poppers. Her beauties are crammed with Nutella (hazelnut chocolate cream) glazed with vanilla icing and sprinkled with nuts. As a plate of cookies and a goblet of rum were set forth for Santa every Christmas Eve in our Tokyo home, rum glaze replaced vanilla flavored icing and cookie cream took the place of chocolate Nutella. (Carrot sticks were also prepared for Rudolph and the reindeer gang.) What traditions continue to delight you during the Christmas / Hanukah holidays? Marriage brings the blessing of two traditions becoming one...David and me on the day of his proposal. Cookies and rum are a familiar tradition for this Ninja Baker. However, cookie cream was a first. Have you tried the stuff? It tastes exactly like butter cookies but in peanut butter form! Decadent and rich, a teaspoonful goes a long way. Combined with the doughnutty rum-spiked pastry, the cookie cream buns are small but mighty Christmas presents! on top of this rum spiked glazed sweet! We have Megan Beimer, wife of a US Marine and Pillsbury Bake-Off's finalist , to thank for Rum Glazed Cookie Cream Buns which were inspired by her winning Chocolate Doughnut Poppers . Megan's recipe calls for sheets of seamless refrigerated dough and states that crescent rolls are a fine substitute. Keeping everyone in good spirits with their dishes and desserts are the hosts of today's #SundaySupper are Alice of A Mama, Baby & Shar-pei in the Kitchen  and DB (aka Foodie Stuntman) of Crazy Foodie Stunts . They've also compiled a list of creative use of treats with alcohol. For your invite to the #SundaySupper at Twitter, please scroll down. Beet Relish  by What Smells So Good? Wishing you myriads of reasons to be of good cheer.